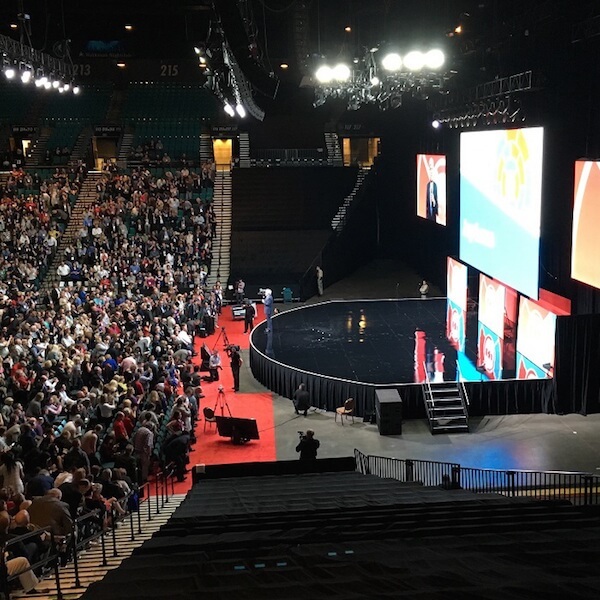 One week, 8,000 attendees, 5 languages, at the prestigious Grand Garden Arena of the MGM Grand in Las Vegas; for the second year, Conference Rental has successfully delivered language simultaneous interpretation equipment and services to this large convention for an international realtor. The Grand Garden Arena is well known for numerous boxing superfights. Conference rental was tasked with the challenge to provide infrared coverage throughout the space – having a seating capacity of 16,800 – to deliver digital infrared language distribution in 5 languages. Infrared technology was required to avoid interference issues typically encountered with RF systems, particularly in crowded cities such as Las Vegas. Another reason for using infrared technology was to enable freedom of movement from room to room, allowing attendees to keep their language receivers to attend breakout sessions in the nearby conference center. The Conference Rental technicians designed and installed a digital IR receiver system in the catwalks to provide coverage throughout the massive arena. Attendees traveling from around the world were able to listen to the conference in their preferred language. The following ones were supported: Spanish, Portuguese, Korean, Japanese and Hebrew.